Dhaka(PTI): Bangladesh’s embattled former premier Khaleda Zia has surrendered before a local court that granted her bail in graft and defamation cases, a week after it issued an arrest warrant against her. “The bail was granted on conditions that she would inform the court before leaving the country in future,” an official of the court told reporters yesterday. He said Zia, 72, also the chairperson of the Bangladesh Nationalist Party (BNP), had to give a bond of Taka 100,000 (USD 1211) for obtaining the bail. Surrounded by her party activists, Zia came to the court complex in old Dhaka and surrendered before the judge, a day after she returned home from London after a three-month visit. Court officials and lawyers said she appeared on the dock and sought the bail this morning at the makeshift court set up on Alia Madrasha ground at Bakshibazar in the old city. After granting the bail, the court held a routine hearing wherein she gave an hour long statement claiming her innocence in the graft cases. The judge fixed October 26 as the date for the next hearing. “She also claimed that cases filed against her are false, motivated and imaginarily made up and aimed at harassing her,” a defense lawyer said, adding she was allowed to speak as the court accepted her petition to give a statement. Court officials and lawyers said Dhaka s Metropolitan Magistrate issued the first warrant as Zia failed to appear in another court over a case accusing her of undermining the Bangladesh s map and national flag. She is being tried for inducting in her 2001-2006 cabinet the people who were opposed to the country’s independence and committed crimes against humanity by siding with the Pakistani troops. 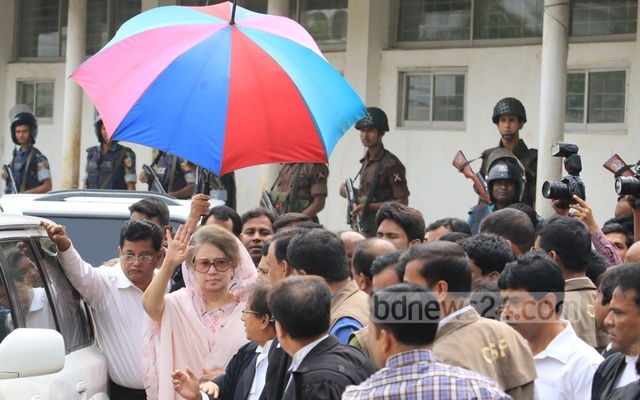 She obtained the bail against the second warrant issued by Dhaka s Fifth Special Judge’s Court as she evaded appearance in a case involving her alleged corruption with funds of an orphanage trust named after her husband and slain president Ziaur Rahman. a week after it issued an arrest warrant against her.